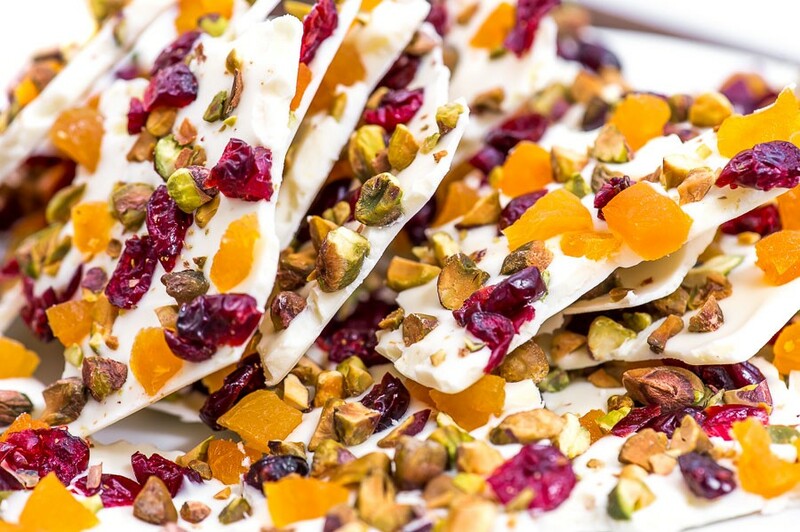 If you are on the hunt for a quick and delicious home-made gift, look no further. 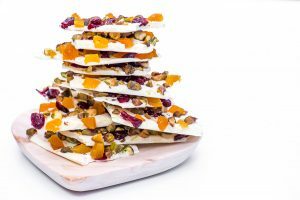 This white chocolate bark is so easy to make, and the bright colours just scream “festive”, making it perfect for this time of year. In order to get beautifully glossy chocolate that will break with a sharp snap, you need to temper it. But don’t let that word scare you! It’s easy to do. The reason we temper chocolate is to encourage the cocoa butter in the chocolate to harden into a specific crystalline pattern, which maintains the gloss and texture for a long time. When chocolate is melted and cooled, it can crystallize into any one of six different forms. Only one of these (the beta V crystal) hardens into the firm, shiny chocolate that we want. The easiest way to achieve this is to carefully heat ¾ of your chocolate until almost melted, then add the remaining chocolate (seeding chocolate) in small amounts whilst stirring constantly. Using a large baking tray makes a nice thin bark which I personally prefer. But if you like the pieces to be thicker, just spread the chocolate over a smaller area. Preheat the oven to 180°C. 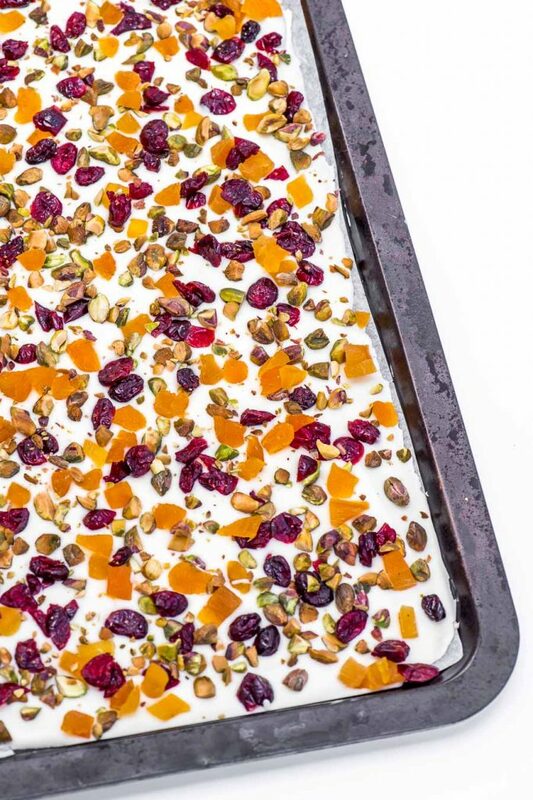 Spread the pistachio nuts onto a lined baking tray and sprinkle over a pinch or two of salt. Roast the pistachio nuts for 6-8 minutes, then remove from the oven and allow to cool. 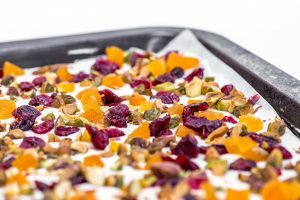 Line a 25cm x 35cm baking tray with greaseproof paper and set aside. Chop the apricots quite finely, so that they are about the size of the cranberries. Once the nuts have cooled, chop them roughly, again they should be about the same size as the fruit pieces. Place 300g of the white chocolate into a heatproof bowl over a pan of very hot water (or microwave in 30 second increments). Stir occasionally, then remove it when it is almost all melted – do not allow it to overheat. Stir the mixture to cool it slightly, then start adding the remaining 100g chocolate (the seeding chocolate) about a tablespoon at a time. Continue adding and stirring, until the mixture is smooth and all the chocolate is dissolved. This will take around 10 minutes depending on how warm the weather is. If necessary, you can microwave the mixture for 10 seconds if it is not yet completely melted (See TIP below). Now pour your tempered chocolate onto the lined baking tray and spread it evenly with a palette knife to all the edges. Immediately sprinkle over the fruit and nuts, as evenly as you can, and lightly press down into the chocolate. Place in the fridge for 30-60 minutes to set. Once set, break into uneven pieces of “bark”. Store in the refrigerator or rap up in a beautiful box and give as a gift. *Alternatively you can purchase the pistachio nuts in their shells, already roasted and salted. I found these to be a bit too salty though, and it is quite a mission to take all the nuts out of the shells! Woolworths sells pistachio nuts raw and already shelled. Do not allow any chocolate to go above 32°C after tempering.